For Lake Orion Exterior Painting service you can trust, contact SJB Painting at (248) 802-7465 for a free estimate or click here to see photos of our exterior painting work. You can also read our excellent Google Reviews here. Painting and staining seals off exposed areas that are prone to damage from termites and other wood-eating pests. We all know the effects extreme temperatures, salt and ice can have on us, so just think about what your house goes through! A fresh protective coating adds a barrier between your residence and Old Man Winter. Vinyl siding should last up to 50 years. However, everyday wear and tear can cut down on that lifetime. Painting can help to not only keep vinyl siding looking fresh, but also extend its life and keep money in your pocket. If you’re putting your house up for sale, a freshly painted exterior makes a world of difference. Even if you aren’t planning to sell your house, giving the exterior a refresh can boost the charm of your neighborhood. Mold and mildew can break down the structural integrity of your home’s wood surfaces. Unprotected wood is much more susceptible to water damage. If your wood surfaces go unprotected, they can absorb water from rain and dew and begin to soften, swell and decay, thus leading to replacement of boards or even entire decks or siding. 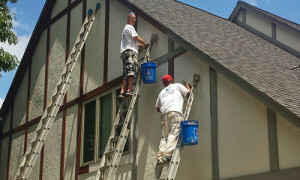 If you are in need Lake Orion Exterior Painting, call SJB Painting at (248) 802-7465 for a free quote.